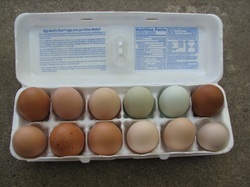 Organic chicken eggs for eating are available all year. Eggs are soy-free, mixed colors and sizes in each carton: medium to jumbo. I collect eggs throughout the day so they don't stay in the heat. Although eggs will keep for months in the refrigerator, like any produce, they are best when fresh. My eggs have a high turnover and are generally no more than a week old. Older eggs are best for hard boiling since very fresh eggs do not peel easily. Organic turkey eggs for eating are occasionally available Eggs are soy-free. Turkey eggs are considered to be a gourmet item, something you cannot buy in a regular grocery store and also rare at Farmer's Markets. They have a very thick shell, very large yolks and flavor similar to chicken eggs and very creamy. 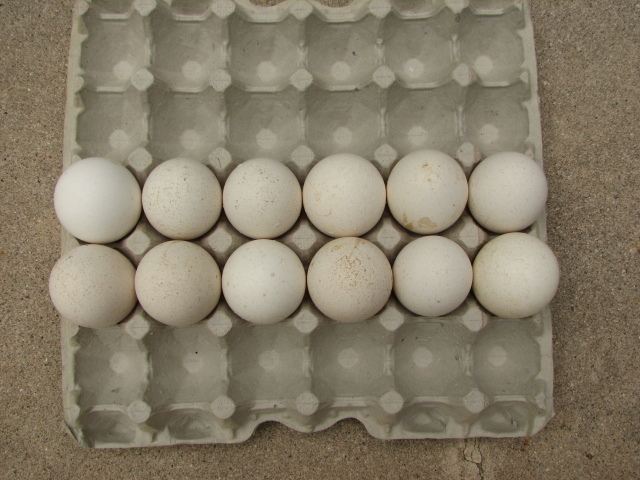 They are huge eggs, weighing 1-1/2 times the weight of a large chicken egg. 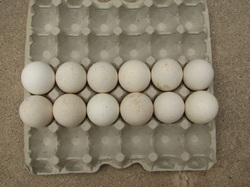 dozen with exchange of a clean carton.